The AIM 2500 CNC spring coiler can handle wire nearly twice as thick as the AIM 2000, offering manufacturers a wide range of choices in terms of medium/ medium-heavy duty springs. AIM CNC coilers come standard with Windows-based user interfaces, Delta Tau “PMAC” motion control cards and industrial touch screens. 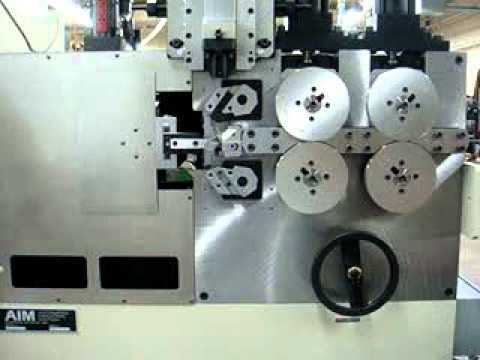 Our spring coiling and wire forming systems are on the leading edge of technology, and our expert service team will make sure your operators are ready to put the machinery to work. Whether you’re a job shop seeking a versatile coiling solution, or an OEM manufacturer interested in automating spring production, the AIM 2500 CNC spring coiler provides the power, durability and accuracy you need. To learn more about the AIM 2500, or any of our other CNC spring coilers, download our equipment brochure below. Coil Diameter Range 3 Index to 4"